Earlier this week, Andy Graziano of The Hockey Writers and I discussed debating the Blackhawks chances of bringing the Stanley Cup back to the Windy City this season. Despite the fact that Andy has made some incredibly valid points and it’s difficult to argue with the success of Chicago this season, their sensational season will not be ending with a parade. Andy, you’ve done a great job at THW but here are five reasons why you are wrong about the Chicago Blackhawks. Goaltending: Coming into this season, the only major question mark Chicago faced was between the pipes. Specifically, could Corey Crawford and Ray Emery play well enough to get the Hawks back to the Promised Land? The tandem answered the bell in a big way early as each goaltender played a significant role in Chicago’s record setting start. That being said, none of it matters if they flame out in the playoffs. And while everybody has to win their first one sometime, there will always be question marks until they do it. Sure, Ray Emery took the Senators on a run to the Finals a few years ago but neither he nor Crawford have delivered the goods to this point and will be questioned until they do so. The Shootout: The Hawks have earned 11 of their 51 points via the shootout, or roughly 20%. Without those points, they would still lead their division but not the Western Conference. Ultimately, that doesn’t really matter once the playoffs begin but the fact remains that Chicago won’t be able to rely on Patrick Kane’s superhuman moves in the skill competition to get them through once the postseason begins. 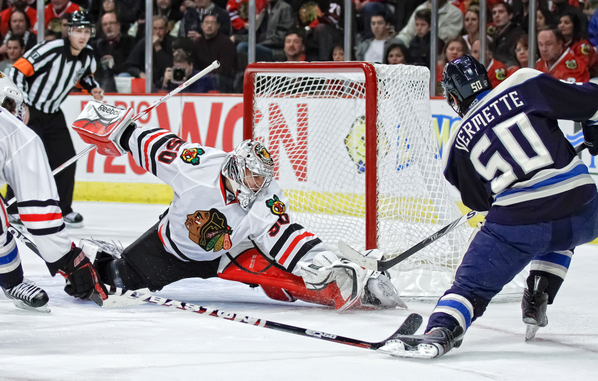 Defense: Why, when the Hawks are third in the league in goals against, is defense a question mark for Chicago? It’s simple. There are teams out there that this blue line does not match up well against, particularly if they are to play them in a seven game series. Specifically, teams with big, strong power forwards give the Hawks defensemen fits. Have you watched, for example, them play Anaheim this year? Chicago can’t handle the likes of the physical fore-checking of players like Ryan Getzlaf, Corey Perry and Bobby Ryan. Over a seven game series, they will be worn down and, ultimately, won’t find success. Even if they can get passed the Ducks, the prospect of facing Boston in the Final still looms (how’s that for a dream match-up for the league?) and that is a task they may not be up for. Parity: Long gone are the days of a team dominating the NHL wire to wire. Free agency and the salary cap have brought with them a league full of parity. Just look at what happened last year: the Kings underachieved all season and squeaked into the playoffs as the West’s 8th seed only to ride on the back of white hot goaltender Jonathan Quick and take home the Stanley Cup. That was an extreme example – the Kings were the lowest seeded team to ever win a championship – but it just goes to show that all it takes is one hot goalie to derail a team’s Cup aspirations. As a result, it is rare that the league’s top regular season team sips from Lord Stanley’s Cup. In fact, only three teams this century have won the President’s Trophy and Stanley Cup in the same season and none have since the 2008 Red Wings. If the Blackhawks do indeed lock up the President’s Trophy, history won’t be on their side for winning the only trophy that matters. The Streak: While Chicago’s streak to start the season was an incredible story, it could come back to haunt them in the long-run. It had to have taken an incredible toll, both mentally and physically on the entire team. The injuries, though not necessarily a direct correlation of the streak, are starting to pile up. Marian Hossa, for example, is banged up and Patrick Sharp is out for an extended period. While the team does have time to get healthy, they may have peaked at wrong the time. Yes, the Blackhawks have had an incredible season. Their story has been one that hockey desperately needed to shake off all of the terrible P.R. from the debacle that was the lock out. Unfortunately for Chicago fans, though, none of that will be enough to raise another banner to the United Center rafters next fall. epitomizes everything about team sports, hard work and dedication. believe you are incorrect in your assumption. filling the shoes of departed Mike Haviland. in 51 career playoff games. These two just might not let the Blackhawks lose. 1.60 – in the playoffs, rarely does a team win on the power play. capacity of 20,500, at times it is like having a sixth skater on the ice. 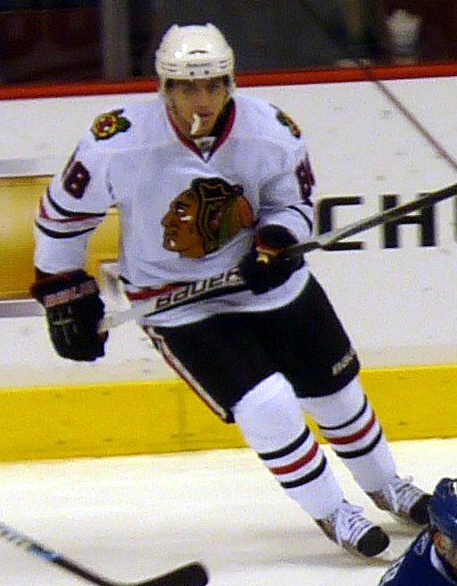 Hawks overcame the Philadelphia Flyers on Kane’s overtime winner in game six. forget they rebounded from a 5-1 trouncing in game one of that Vancouver series.